Campus of the Tajik national university. Source: Personal archive.In a recent Eurasianet commentary, two respected figures of Eurasian studies, Edward Schatz and John Heathershaw, discuss the Tajik government’s tightening control over the local academic sphere by the government. They elaborate three options for funding bodies, western universities and field researchers: a refusal to cooperate with Tajik state institutions and academics employed there; a blacklist of institutions with a track record of repression, which, in their opinion, in practice would be similar to “a comprehensive boycott”; and finally, critical engagement and caution in entering partnerships with Tajik state institutions. In her response to the article, Malika Bahovadinova discusses the problematic use of the authoritarian label, the potential consequences of further isolating the Tajik academic community through boycotts and blacklists, and the power hierarchy between foreign scholars and local researchers, with the latter often reduced to the former’s data providers. In my response, I would like to discuss the partnerships of foreign researchers with Tajik official bodies, which, according to the Eurasianet commentary, make research like my own academically non-valuable and ethically dubious. I will provide some reflections on the production of knowledge on Tajikistan by foreign researchers and refer to my experience as an early-stage female researcher with over three years of fieldwork in the country. My research is mainly on development aid in Tajikistan and interactions of international organisations with government institutions and local communities. 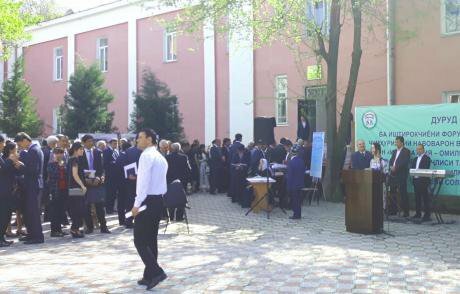 April 2017: Tajik Academy of Sciences - celebrations of the day of science. Source: Personal archive.For many years, knowledge production on Central Asia has been relegated to the backstage of the research process. New knowledge was generated and published, but the question of how this knowledge was acquired was rarely discussed beyond informal conversations and short methodological sections in the introduction to academic books and articles. Today, the nuances of knowledge production have made it to the frontstage. Scholars of Central Asia and other parts of the world have started reflecting on issues such as researcher safety while conducting fieldwork and a new volume examines research methods and risks in authoritarian contexts, including in Central Asia. A number of events on the subject have been taking place in European universities. While such debates on how we do research might be especially useful for younger researchers who have yet to start their field work, the discussion appears to have already been skewed by a safety and security lens. While it is important that we discuss how to do research effectively and minimise risks in the field, we are still neglecting to scrutinise ethics and power relations embedded in research, and to promote collaborative research methods and designs. We have just started unpacking these matters, but Schatz and Heathershaw call for a boycott of partnerships between local and international researchers in Tajikistan. I believe that building partnerships with state institutions is a necessary step for any foreign researcher who intends to conduct research on Tajikistan in Tajikistan. This isn’t a matter of personal preference, but a pre-requisite to operate in respect of local legislation. Whether we like it or not, official bodies in a given country decide the rules to conduct research there as a foreigner. Currently, in Tajikistan, foreigner researchers need either to have a permission from the Tajik Ministry of Foreign Affairs, or secure an affiliation with a local research institution, which is accompanied by the granting of a research visa. Building these partnerships can be extremely lengthy, complicated and bureaucratic. For example, it took me five months to obtain an affiliation with Tajik National University. To do this, I had to build relationships with university’s management and gain their trust, familiarise myself with the work of various departments and collect a huge number of supporting documents from the country and abroad. Affiliation to a local research institution, however, was not simply a piece of paper. Once affiliated, I became involved in university matters. I had a specific work plan, which was approved by the dean, as well as deliverables to reach. I worked in collaboration with an academic supervisor from the Tajik university, who involved me in various projects. He invited me to participate in various local conferences, asked me to write short articles for a local academic journal, comment on his work, and even teach some of his classes. I joined the local academic community at the research library. 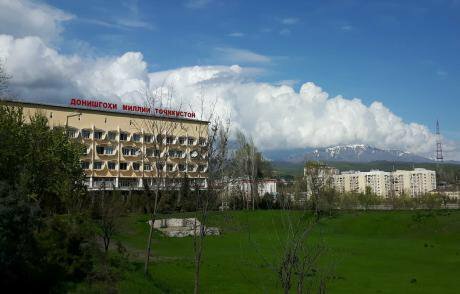 Tajik universities are underfunded, professors receive very low salaries and classrooms are often cold in winter. There are no national research grants available. Still, I have always met with interest from the local academic community, and was often asked about my progress and findings. I had a chance to discuss my research with employees of the Ministry of Foreign Affairs and some Tajik embassies abroad. I never had to lie about my research topic and the critical approach I was taking. I never had to bribe anyone to obtain information for my research, nor was I ever asked by anyone to reveal the identities of my interviewees and the content of the interviews. To my knowledge, none of my interviewees has been interrogated by the state authorities after our conversations. I know of several foreign researchers who followed a similar path to conducting research in Tajikistan. They are anthropologists, geographers, political scientists, historians. Most of them are at an early stage in their careers, but have spent a significant amount of time in the country, continue to visit it regularly and are truly passionate about it. They have managed to conduct research on a broad range of topics concerning Tajikistan, and some have co-authored work with local scholars employed in official bodies. Aren’t these collaborations — which we developed with local official bodies during years of work — “academically valuable or ethically permissible”? Can our attempt to conduct research that is ethical and based on thorough fieldwork, in full respect of Tajik legislation, no longer be deemed “academically valuable or ethically permissible”? During my fieldwork in Tajikistan, I have met foreign researchers who did not want to engage with any official bodies. In most cases a certain pattern can be observed. They would visit Tajikistan for a short period of time, often without much prior knowledge of the country or the local languages. They would come to Tajikistan on a tourist visa, conduct a series of interviews and leave the country soon after. I witnessed bizarre situations when these researchers were convinced that, because they were in a country where corruption is said to be widespread, they felt they could bribe literally anyone — including waiters, to get a table in restaurants where all tables had already been booked. Conducting research on a tourist visa is of course possible, and since the introduction of an electronic visa system in Tajikistan obtaining one has become easier. However, I believe that in such case the researcher needs to acknowledge that they are breaching local legislation, and this might have an impact on their safety, but mainly it can negatively influence anyone they interact with. I have heard of several cases when interviewees of researchers who briefly visited Tajikistan on a tourist visa to conduct sensitive research were later interrogated by state authorities. Obviously, this does not justify the actions of the state bodies. Rather, I am drawing attention to the issue of positionality of foreign researchers and the hierarchies of knowledge production. First, there is the instrumental approach to research as a data collection process, which limits local subjects to pure objects of academic inquiry. Second, we need to ask whether it is legitimate for foreign scholars to break domestic laws because they work at western universities and produce knowledge there. Is such knowledge academically valuable or ethically permissible? Alas, most Tajik institutions and individual researchers cannot say the same.